The Illinois Golf Courses Map points out the exact location of the golf grounds of the state. The State of Illinois has 770 golf grounds. Alton, Rockford, Chicago, Peoria, Highland Park, Springfield, Bloomington, Mundelein and Naperville are some of the prominent golfing destinations of the State of Illinois. Timber Lake Country Club, Newman Golf Course, Leo Donavan Golf Course, Mount Hawley Country Club and Peoria Golf Learning Center are some of the notable golf grounds of Peoria County. The Woodlands Golf Club, Roseland Golf Course, Belk Park Golf Course and Emerald Greens Golf Course are worth mentioning golf grounds of Alton. Beverly Country Club, Robert Black Golf Course, and Jackson Park Golf Course are the well known golf grounds of Chicago. Springfield has several golf courses. The Bunn Golf Course, Bergen Golf Club, Long Bridge Golf Course, and The Oaks Golf Course are some of the important golf grounds of Springfield. Exmoor Country Club, Sunset Valley Golf Course, Skokie Country Club and Deerfield Golf Club are well known golf grounds of Highland Park. The County of Bloomington has several golf grounds of Highland Park Golf Course and Hazy Hills Golf Course. 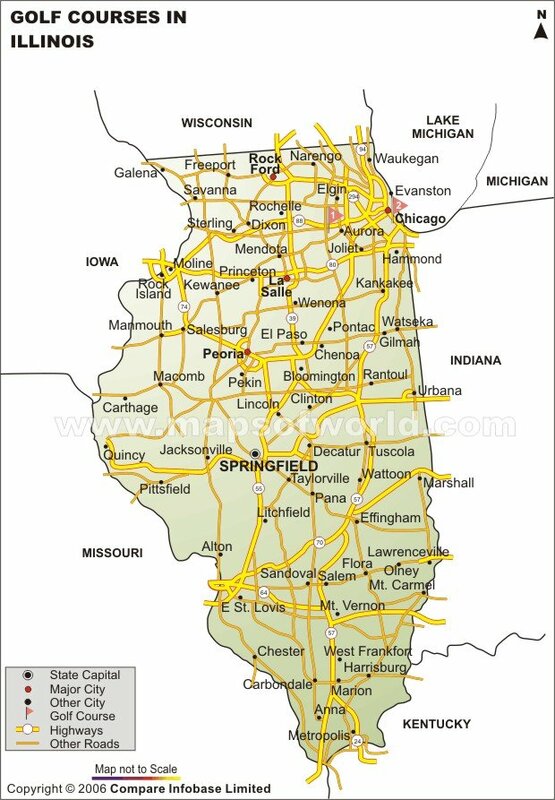 The Illinois State Map shows the several golf courses within the respective Counties of the state.